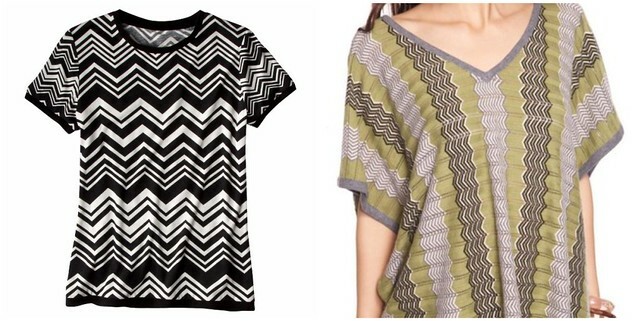 The Missoni for Target line has hit stores and online 2 days ago. It certainly has created a shopping frenzy. Target site was down for more than 8 hours. I don't really understand all the hype. It got me curious that I had to stop by my local Target to check it out. I have no intentions whatsoever to purchase any of the items from this collection. The zigzag pattern makes me dizzy and it is totally not my style. I was thinking about picking up a cardigan and a pair of ballet flats for my little girl. At the end, I decided not to because the quality is just nothing more than typical Target clothes. Blouses are made from 100% polyester and sweaters are super thin. The ballet flats that I was eyeing for my little one have no support at all. 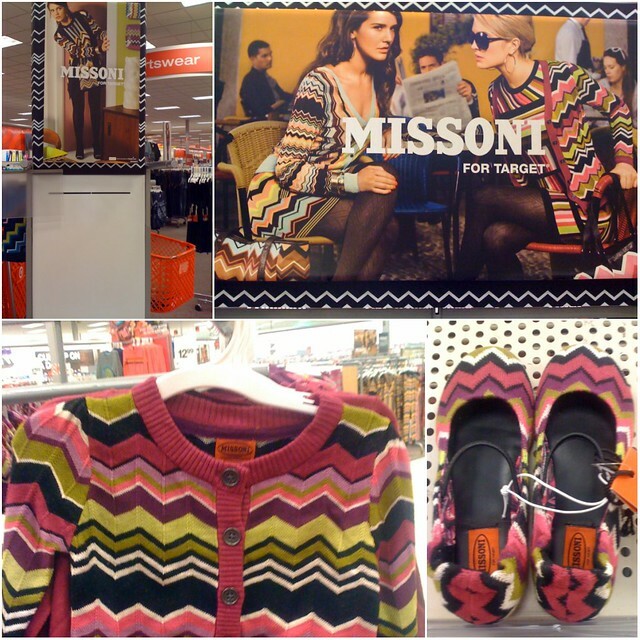 Did you pick up any of the Missoni items at Target? i noticed several similar zig-zag items on the F21 site too yesterday when I was browsing! i really don't understand all the Missoni hype either. Personally i didn't find any of their styles something i wanted for my closet so i just avoided Target altogether. i do like the fact that Target is collaborating with these big-name designers though! so that's why the target site was down! i was trying to see if something that i wanted for my room was in stock at my local target, and the site was down....luckily when i went it was! my sentiments exactly! the zigzag patterns also makes me dizzy LOL! i actually like the pattern in small amounts. but it would be so much better in a quality material, like a little cashmere sweater-dress or something? You are right about F21 carrying similar stuff! I was never excited about the Missoni for Target so didnt bother.. but seriously there was a major hue n cry about it! Wow, that's what Missoni stuff looks like? Sorry, but those clothes are way ugly! I heard the hype too, and I was curious. Now I'm not. I was trying to get onto the website all day, couldn't get in til the evening!! I like the flats...they're cute, but they were sold out anyways. After thinking about it more...I rarely wear flats, and especially not such colourful ones! I was considering a cardigan too, but when I saw the prices, I was like forget it!!! I'm hoping next trip I make across the border, maybe there might be some stuff leftover or someone returned something (and I hope it'll be discounted!). Ping and I were just talking about that F21 zig zag dress. I thought it was wayyy cuter than any of the Missoni womens apparel Target put out. I love Chevron stripes though. but I dont love them bold & multi-color. Some of the items, I thought were cute, but not worth the waiting in line & frenzy. I'm a sucker for Missoni and have been looking for that perfect shawl/scarf for ages now. I want the real Missoni, not the made in China imposter. People dont seem to get that they're not actually buying Missoni. No, they're buying Target for double the price. How sad! I feel very MEH about this missoni for target collection (to be honest was never a huge fan of the designs...personal preference) so it was a little surprising to me how quickly it crashed target's website, which I imagine has gone through many series of upgrades. In any case, thank you for sharing the f21 lookalikes. I think paying triple retail for target quality is outrageous! I think the hype is mostly from the designer name rather than the actual products. I wasn't a fan of the styling of a lot of clothes, zigzag overload. But if used sparingly and in moderation, could be stylish and great for a pop of color. 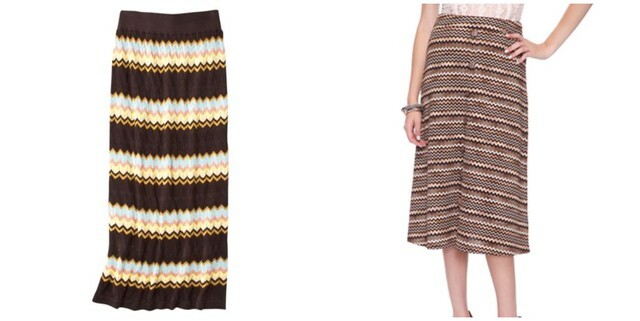 Great finds on the f21 dupes, which I actually like better over a lot of the Missoni ones. I didn't understand the hype either! Some of the floral printed home stuff is pretty, but the clothes are not that nice. And it is so overpriced and when I checked it out at my target store I was surprised how bad the quality is for the price. I tried on the same flats but for women and they are no better than their regular cheap ballet flats but for twice the price. I did however give in for the black suede heels with the chunky heel. When I tired them on I was surprised that they were so comfortable and when I come across a comfortable heel, I just can't resist. But other than that I would not waste my money for anything else in that collection. I was pissed I had to work lol...did all these people take off to shop at target early haha?? Yeah, I am also not a fan of Missoni. I checked out the target site after seeing all the headlines, and nothing really appealed, although much of it was already sold out. The zig zags are cool, but I don't see all the hype about it either. The quality I see online looks just about the same as F21. 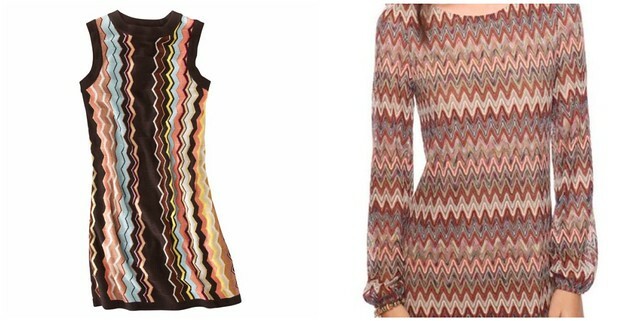 In fact, if you showed me the Missoni items without telling me they're Missoni, I'd guess F21 first. Some of the items aren't too bad though. Anyways, hope you have a great weekend. Oh I'm glad you did this post.......I've been too busy to check out the Missoni line at Target but I've been dying to go. I don't own anything from Missoni so I had no idea what to expect at all! I went to my local Target the day after the release of the Missoni line, and I was really not impressed at all. The zigzags were too much for me - I think that were I built like a runway model I could pull them off, but being petite I tend to stay away from loud, big prints. I actually went in to check out the bike, and I was appalled at the quality for the price. Granted, I know not to expect quality in Target or other department store bikes (most bike companies manufacture an entirely different line that they sell in discount stores like Target...kind of like how the Missoni line that you buy at Neiman Marcus is not the same one at Target). I was also checking out the F21 stuff, for the same reason you were, but I don't think zigzags are my style. I see a horizontal zigzag and I can't help but think of Charlie Brown. Thanks for voting girl! 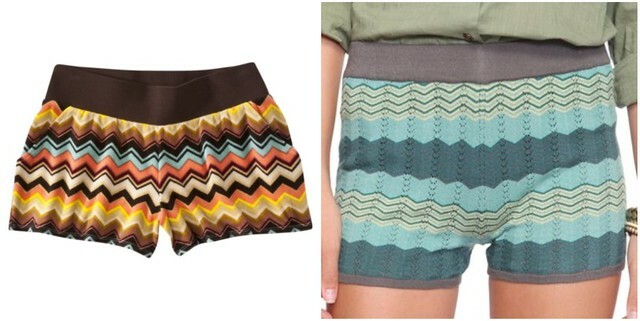 I agree with you on the whole Missoni hype... not my thing, but hey, I guess it's good for Target haha. i like some of the Missoni dresses, scarfs and bags, but it was all sold out. But you are so right! F21 is a great option!! !